Several lines of evidence suggest that the striatum has an important role in spatial working memory. The neural dynamics in the striatum have been described in tasks with short delay periods (1–4 s), but remain largely uncharacterized for tasks with longer delay periods. We collected and analyzed single unit recordings from the dorsomedial striatum of rats performing a spatial working memory task with delays up to 10 s. We found that neurons were activated sequentially, with the sequences spanning the entire delay period. Surprisingly, this sequential activity was dissociated from stimulus encoding activity, which was present in the same neurons, but preferentially appeared towards the onset of the delay period. These observations contrast with descriptions of sequential dynamics during similar tasks in other brains areas, and clarify the contribution of the striatum to spatial working memory. One of the most fundamental components of cognition is working memory, the ability to remember information over short periods of time and use the memory to guide ongoing behavior (Baddeley, 1992, 2003; Cowan, 2008). Given the fundamental nature of working memory, much effort has been invested in studying its underlying neural mechanisms, and several cortical regions have emerged as important contributors. For example, neural activity in prefrontal and parietal cortex encodes stimuli during the delay period of working memory tasks, suggesting these areas contribute to maintaining the memory (Arnsten, 2011; Baeg et al., 2003; Erlich et al., 2015; Funahashi et al., 1989; Fuster and Alexander, 1971; Guo et al., 2014; Hanks et al., 2015; Harvey et al., 2012; Horst and Laubach, 2012; Jung et al., 1998; Kojima and Goldman-Rakic, 1982; Lak et al., 2014; Powell and Redish, 2014; Romo et al., 1999; Schoenbaum and Eichenbaum, 1995; Shadlen and Newsome, 2001; Spellman et al., 2015; Wang et al., 2013b; Yoon et al., 2008). However, working memory is not implemented merely in cortex, but instead emerges from the interaction between cortical and subcortical areas (Floresco et al., 1997; Kopec et al., 2015; Parnaudeau et al., 2013), with the striatum as a key subcortical region. For example, human imaging studies have noted increased activation of the striatum during working memory tasks (Chang et al., 2007; Lewis et al., 2004; Olesen et al., 2004; Postle and D’Esposito, 1999). In addition, in the primate caudate, metabolic activity and single cell recordings point to elevated activity during spatial working memory (i.e. tasks that involve a memory for location) (Kermadi and Joseph, 1995; Levy et al., 1997). Finally, electric stimulation or lesions of the primate caudate, as well as pharmacological silencing of the analogous region in rats, the dorsomedial striatum (DMS), leads to disruptions of spatial working memory (Balleine and O’Doherty, 2010; Cohen, 1972; Mordvinov, 1981; Rosvold and Delgado, 1956; Spencer et al., 2012; Stamm, 1969). Neural correlates of working memory in the striatum have been characterized in the case of relatively short delay period (1–4 s), but less is known about striatal dynamics in the case of longer delay periods (Antzoulatos and Miller, 2011; Chiba et al., 2015; Hikosaka et al., 1989; Histed et al., 2009; Kawagoe et al., 1998; Kermadi and Joseph, 1995; Pasupathy and Miller, 2005). This is a significant knowledge gap, given that animals (and humans) can remember stimuli over many seconds in real world situations. We sought to answer several questions in this study. First, is sustained delay-period activity a feature of striatal activity in the case of long delay periods (>4 s), as has been observed in primates for short delay periods (1–4 s)? (Hikosaka et al., 1989; Kawagoe et al., 1998; Schultz and Romo, 1988; Schultz et al., 1994) If so, does that activity encode the memory of the stimulus throughout the delay period? Another possibility is that there is sequential transient activation of neurons in the striatum during the delay period. This is a reasonable hypothesis, given that (1) memory-encoding sequences have been observed in cortical and hippocampal areas in working memory tasks (Fujisawa et al., 2008; Harvey et al., 2012; Horst and Laubach, 2012; MacDonald et al., 2013; Pastalkova et al., 2008), and (2) the striatum is known to exhibit sequential activity in tasks that do not directly involve working memory (Lustig et al., 2005; Matell and Meck, 2000, 2004; Mello et al., 2015). If we do observe sequences during a working memory task, do those sequences encode the memory of the stimulus throughout the delay period, as has been observed in other brain regions? To address these questions and characterize striatal dynamics during working memory, we trained rats to perform a spatial working memory task that involved long delay periods (up to 10 s). We recorded single unit activity during this task from the DMS, a region involved in spatial working memory and other related aspects of cognition (Corbit and Janak, 2007; Jin et al., 2014; Kimchi and Laubach, 2009; Ragozzino et al., 2002; Stalnaker et al., 2010; Wang et al., 2013a; Yin et al., 2005). We used information theoretic analyses and population decoding to characterize the neural dynamics in the recorded population. Rats were trained on an operant delayed non-match to position (DNMP) task (Figure 1A,B) (Dunnett et al., 1988). At the beginning of each trial, a sample lever would appear in one of two possible locations on the front wall of the chamber. The rat was required to press the sample lever, at which point the lever would retract into the wall and the delay period began. The end of the delay period was signaled by the illumination of the nose port on the back wall of the chamber (delay period duration of 1 s, 5 s, or 10 s, determined randomly). During the delay period, the nose port remained inactive (i.e. the light in the nose port remained off and nose-poking has no effect), and the rats spent the majority of their time at the nose port (Figure 1B, bottom-center panel; Figure 1—figure supplement 1A), waiting for the variable length delay period to terminate. After the illumination of the nose port, the rat was then required to place its nose into the illuminated port in order for both levers to appear in the front wall of the chamber. If the rat subsequently pressed the choice lever that did not match the initial sample lever ('non-match'), it would receive a liquid reward in a central receptacle (Figure 1A–B). Delayed non-match to position (DNMP) task. (A) Schematic illustration of the task structure. A trial starts with the presentation of the sample lever at one of two locations ('sample press'). By pressing the sample lever, the rat initiates the delay period (1 s, 5 s, or 10 s duration). At the end of the delay period, the nose port on the back wall of the chamber is activated, and by entering the port (i.e. nose-poking), both levers are presented. By pressing the lever that does not correspond to the sample lever at the beginning of the trial (i.e. choice press), the rat receives a reward; pressing the other lever results in a timeout (T/O). (B) Top: Schematic illustration of the chamber and the rat’s position at the time of the sample lever press (left), the delay period (middle), and the choice lever press (right). Bottom: Occupancy-map of the rats’ head position for right-sample trials at the time of the sample lever press (time window from 250 ms before to 250 ms after lever press), delay period (center, time window is the entire delay period for 10 s delay period trials only), and choice lever press (right, time window from 250 ms before to 250 ms after lever press). Occupancy-maps were generated by averaging the occupancy-maps of the 9 rats used in the electrophysiology experiments. Individual occupancy-maps were calculated by binning the head positions over the respective time windows into 0.5”× 0.5” tiles (covering the 9.5”×12” chamber). (C) Accuracy is delay dependent, decreasing as the duration of the delay period increases (p<10–4). Solid black line represents mean accuracy, and dotted grey lines represent the accuracy for each individual rat. Accuracy was calculated from the final recording session. 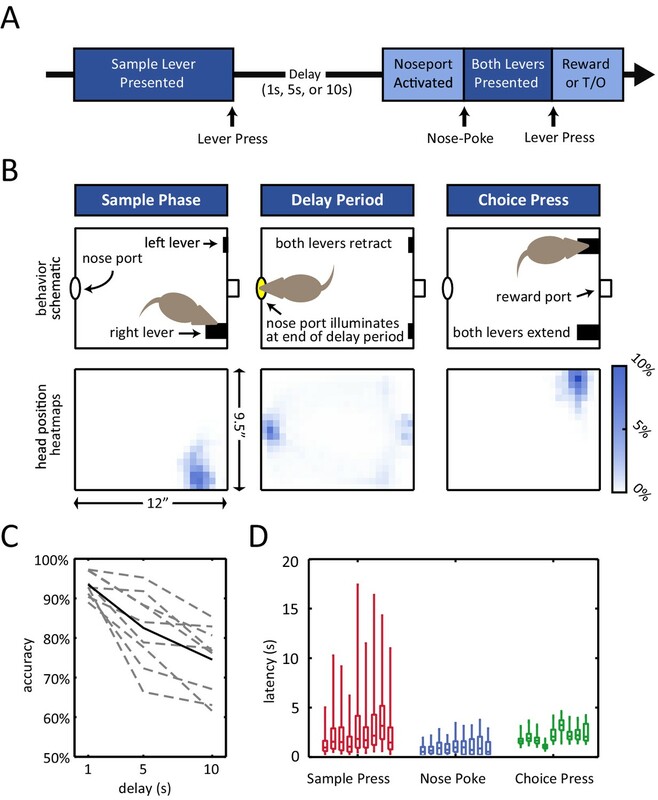 (D) Response latency for each individual rat for sample press (time from sample presentation to sample press), nose-poke (time from nose port activation to nose-poke), and choice press (time from choice presentation to choice press). Center of each boxplot represents the median, edges correspond to 25th and 75th percentile, and whiskers correspond to fifth and 95th percentile. Of note, the rats’ accuracy in this task declined with the length of the delay period (p<10–4 repeated measures ANOVA, Figure 1C). This delay-dependence provides validation that the short-term memory component of the task played a role in the rats’ performance, as expected in a working memory task. In addition, omission rates and response latencies during the task revealed that the rats were highly engaged during the course of each trial. Omission rates were low regardless of the length of the delay period (<10%, Figure 1—figure supplement 1B). In addition, median response latencies were short for all subjects for all 3 types of response (Figure 1D; median sample press latency < 3.5 s, median nose-poke latency < 1 s, median choice press latency < 3.5 s). To determine if neural activity in the DMS contributed to performance of the DNMTP task, we inactivated the DMS using the GABAA agonist muscimol, while rats performed the task (Figure 2A). We found a significant decline in choice accuracy with the infusion of muscimol in comparison to the infusion of saline (Figure 2B–C: p<0.001 effect for infusion day, repeated measures ANOVA, n = 7). Importantly, muscimol infusion had no significant effect on median response latencies for rats, suggesting minimal motor impairment (Figure 2D). We also examined the effects of muscimol on the number of trials performed, sample omission rates, trial abort rates, sample bias, and choice bias and found that none of these measures were significantly affected by DMS inactivation across the population (Figure 2—figure supplement 1, Wilcoxon signed rank test, n = 7). However, a subset of rats did perform fewer trials when treated with muscimol, which is consistent with the DMS being implicated in motivation or response vigor (Wang et al., 2013a). Inactivation of dorsomedial striatum (DMS) impairs accuracy during the DNMP task. (A) Red circles with blue fillings represent location of injection cannula tips as revealed by post-mortem histological analysis. (B) Muscimol infusion in DMS impairs accuracy when compared to infusion of saline (p<0.001; effect of muscimol repeated measures ANOVA, no significant interaction effect between delay length and infusion day). Error bars are ± 1 SEM across 7 rats. (C) Accuracy was significantly impaired for the 5 s and 10 s delay trials (*p<0.05; Wilcoxon signed rank test) but not for 1 s delay trials (p=0.38; Wilcoxon signed rank test, n=7 rats). (D) No signficant effect of DMS inactivation on median response latency for sample press (top, p=0.58), nose-poke (middle, p=0.28), and choice press (bottom, p=0.92; Wilcoxon signed rank test, n=7 rats). Spiking activity for 105 neurons was isolated from the DMS of 9 rats (summary of electrode localizations in Figure 3A). Between 5 and 25 units were recorded in each subject (Figure 3B, inset). 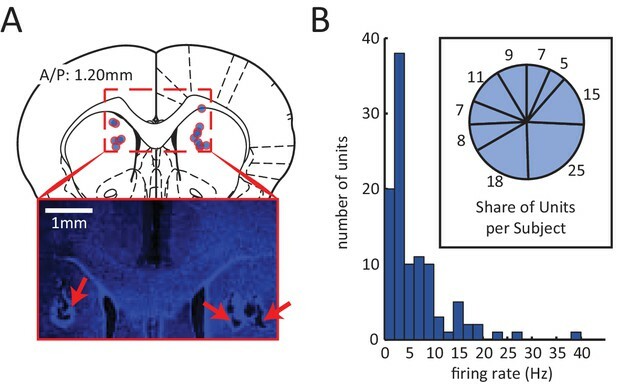 The average firing rates of these units tended to be low (population mean < 6 Hz) (Figure 3B), consistent with previous reports of medium spiny neurons in the dorsal striatum (Berke, 2008; Berke et al., 2004; Mallet et al., 2005). Electrophysiological recording of neural activity in the dorsomedial striatum (DMS). (A) Red circles with blue fillings correspond to location of DMS electrode array tips in 9 rats. Electrodes array rows were oriented in the A/P direction to span a length of 1.6 mm, centered at A/P: 1.2 mm. Inset: Example image of electrode lesions in DMS (blue DAPI stain; 1 mm scale bar). (B) Histogram of mean firing rate of 105 isolated units. Inset: number of units isolated from each rat. To determine if and how the neurons’ firing rates evolved during the course of a trial, we examined the time-varying firing rate of each neuron relative to the onset of the delay period. The recorded units displayed a diversity of firing rate patterns; for instance, the example unit depicted in Figure 4A showed a transient peak in its firing rate a few seconds into the delay period. In order to visualize the activity across the neural population, we ordered the units by the time of the peak firing rate for the 10 s delay trials, and then generated firing rate heat-maps for 1 s, 5 s, and 10 s delay-duration trials (Figure 4B). Neurons displayed sequential peaks of activity that spanned the entirety of the 10 s long delay period (Figure 4B, left panel). The firing rates for the shorter delay trials displayed similar sequential activity throughout the delay period (Figure 4B, middle and right panel), when ordered based on the peak times for the 10 s delay-duration trials (p<10–7, Spearman correlation test between peak times of 5 s-delay trials and 10 s-delay trials). Note, by design, only neurons that were engaged during the first 1 s or 5 s of the 10 s-long delay period could be part by the sequence for the shorter delay trials, which is why the sequences involved fewer neurons for the shorter delay periods. Sequential, transient peaks in the firing rate span the delay period. (A) Raster plot (top) and firing rate (bottom) for an example neuron (aligned to the onset of the delay period). Shaded area represents ± 1 SEM. (B) Heat-maps represent the z-scored firing rates for all units for the 10 s, 5 s, and 1 s delays, aligned to the onset of the delay period. Each row is a single unit. Rows in all three plots were sorted by the peak firing rate time in the 10 s delay trials (left-most plot). (C) Same as A, but spike times were randomly shifted relative to behavioral timestamps. To further validate and characterize the finding of sequential firing rate peaks, we repeated the same analysis after randomly shifting the time of the recorded spikes and the behavioral timestamps for each neuron (Figure 4C). The shifted data (Figure 4C) differed substantially from the non-shifted data (Figure 4B), confirming that the activity sequences that we observed were not an artifact of ordering the activity based on the peak response. In the shifted data, sequences were non-existent in the 5 s and 1 s duration trials and there was no correlation between the order of the peak firing rate for the 10 s delay-duration trials and for the 5 s delay-duration trials (p=0.29, Spearman correlation test). As another method to quantify the presence of sequential firing rate activity, we calculated the ridge-to-background ratio (Harvey et al., 2012; see Materials and methods). Ridge to-background ratios were significantly greater than chance level for all delay period lengths (Figure 4—figure supplement 1A, p<0.001; one tailed test using the ratios from the randomly shifted data as the null distribution). In comparison to the shifted data, the distribution of peak firing rate times in the real data revealed a bias towards the onset of the delay period (Figure 4—figure supplement 2E). In other words, although the sequences spanned the delay period, there were more peaks towards the beginning of the delay period relative to what would be expected by chance (p<0.01, Wilcoxon rank sum test). Because the rats were not stationary during the entirety of the delay period, the possibility arises that the sequences were in fact a byproduct of neural selectivity for position or movement. To control for this possibility, we re-calculated the sequences while using only the subset of time during which the rats were positioned in front of the nose port (Figure 4—figure supplement 2A–D). We found that even when controlling for the rats’ position by excluding times that they were not at the nose port, sequences were evident that closely matched the sequences based on the full dataset (Figure 4—figure supplement 2B). Ridge-to-background analysis confirmed that the presence of firing rate sequences was statistically significant, even when using only data from times when the rat was at the nose port (Figure 4—figure supplement 1B). We therefore conclude that sequential activations of DMS neurons are not a by-product of responses to movement or position. As an additional approach to control for the possibility that sequential firing activity might be due to position and locomotion selectivity, we found that time in the delay period is a significant predictor of neural activity, even when taking into account position/locomotion variables as alternative predictors. More specifically, we modeled each neuron’s spiking activity using two generalized linear models (GLMs), one with position related predictors only (i.e. head position, head direction, and velocity – all calculated using head tracking) and the other with both the position-related predictors as well as time from the delay period onset as a predictor (see Materials and methods for details). Time from delay onset significantly improves the model in 80% of the neurons (84/105) in comparison to a model with only the position/locomotor variables (p<10–4, likelihood ratio test comparing models with and without time from delay period as predictor). This demonstrates that the time-dependent changes in firing rates during the delay period cannot be accounted for by position or the other variables we tested. Note that sequences were not specific to the delay period, as we observed similar sequential activation of neurons when time-locking to other task events (Figure 4—figure supplement 2F, Figure 4—figure supplement 1C). To determine how firing rate sequences during the delay period relates to the sample lever selectivity of the neurons, we compared neural activity for trials when the sample lever was in the right versus the left location, excluding error trials and omission trial. Individual neurons exhibited different patterns of sample selectivity (Figure 5A). One example neuron displayed no choice-selective modulation (left panels, Figure 5A), another neuron was only activated during right sample trials (middle panels, Figure 5A), and finally a neuron displayed different patterns of activation for left and right sample lever trials (right panels, Figure 5A). Sample lever information peaks are clustered towards the beginning of the delay period and are not correlated with firing rate peak times. (A) Each column represents data from an example neuron, with neural activity aligned to the onset of the delay period, and activity color-coded in red for right sample trials and left for blue sample trials. Top: raster plot, with each dot representing a spike. Middle: firing rates for left and right sample trials. Shaded area represents ± 1 SEM. Bottom: Information about sample as a function of time. Shaded area represents the 99th percentile of the maximum information expected by chance across the entire time interval, calculated by shuffling the sample labels for the trials. (B) Left: Heat-map of sample information as a function of time for the 53 neurons that had significant information peaks within the 10 s delay period (p<0.01; one-tailed test using shuffled data for null distribution of peak information within the 10 s delay period). Right: Heat-map showing z-scored firing rates of the same neurons depicted in the left plot. Neurons in both the left and right panels are sorted by the peak firing rate in the delay period, such that a neuron on the left plot appears in the same row in the right plot. (C) Time of peak sample information plotted against the time of peak firing rate for 53 sample encoding neurons (where 0 corresponds to the onset of the delay period). The data reveals sample information peaks times occur earlier than firing rate peak times (p<0.001; Wilcoxon signed rank test), and a lack of correlation between the time of peak firing rate and time of peak sample information (r=0.06, p=0.69; Pearson correlation test). All panels are calculated using 10 s-delay correct trials only. 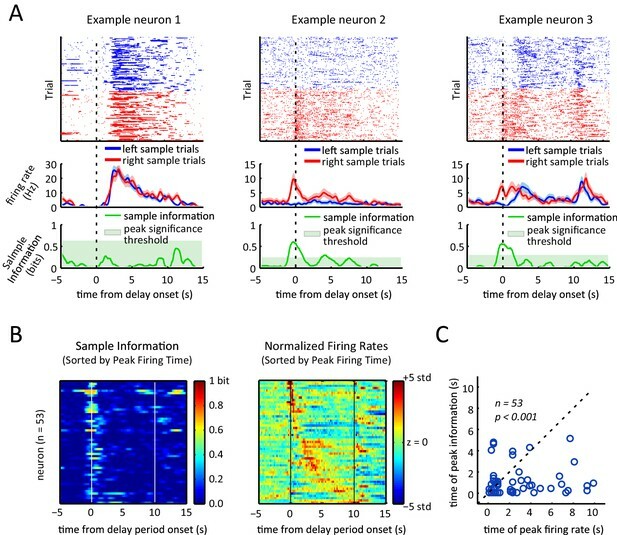 Given the diversity of responses in individual neurons, we turned to mutual information as a method to quantify the amount of information about the sample stimulus encoded in the firing rate as a function of time (Borst and Theunissen, 1999; Dayan and Abbott, 2001; Rieke et al., 1999). We calculated the time-varying mutual information between the sample stimulus and the spike trains of individual neurons (within a 0.5 s sliding window), by assuming that spiking of each neuron is a Poisson point process with a time varying rate determined by the sample stimulus and time from the delay onset (see Materials and methods for details). We found many neurons showed transient information peaks (e.g. example neurons 2 and 3 in Figure 5A). To determine if these peaks were statistically significant, we calculated the distribution of the maximum information across the entire delay period that would be expected by chance for each neuron by repeatedly shuffling the labels specifying whether a trial had a left or a right sample and recalculating the mutual information. A neuron was considered to significantly encode the sample stimulus during the delay period if its peak sample information was larger than the 99th percentile of that distribution (green shaded area in the bottom panels of Figure 5A). By this criteria, 53 of the 105 neurons showed significant encoding of the sample stimulus at some point during the delay period (p<0.01) with peak information values ranging between 0.07 to 0.69 bits (average peak information was 0.34 bits). To compare firing rate sequences to stimulus encoding across the recorded population, we compared the time-varying firing rate alongside the sample information for the subset of neurons that encoded the stimulus significantly at some point in the delay period (Figure 5B). Surprisingly, the sample information peaks did not display a sequential organization to match the peak firing rate sequence. In fact, the time of the peak sample information did not correlate significantly with the peak firing rate time (Figure 5C, Pearson correlation test; r=0.06, p=0.69). In fact, sample information most often peaked towards the onset of the delay period, with more than 80% of the stimulus encoding neurons (45/53) displaying peak information within the first 2 s of the delay period. On average, peak sample information was significantly earlier than peak activity (p<0.001; Wilcoxon signed rank test. Only neurons with significant information peaks were considered for this analysis). We found that individual neurons encode the sample stimulus at specific times in the delay period, and that for many neurons sample encoding was strongest towards the beginning of the delay period (Figure 5). To quantify how sample encoding in the DMS changes throughout the course of the trial we constructed a population decoder that takes spiking activity of all the recorded neurons within a 500 ms sliding window and evaluated its performance using leave-one-out cross validation (Brown et al., 2004; Gerwinn et al., 2009; Ma et al., 2006; Pouget et al., 2003; Quian Quiroga and Panzeri, 2009). (In order to combine neurons across rats, we create pseudo-trials; see Materials and methods). This provided us with a time varying sample decoding accuracy representing how well DMS neurons encode the sample stimulus at different parts of the delay period (Figure 6). In agreement with our findings from Figure 5, sample decoding was highest at the onset of the delay period (at the time of sample lever press) and declined over the course of the delay period (Figure 6A). In order to compare the neural code in DMS for correct and error trials, we calculated the output of the decoder on error trials (after the decoder was trained on correct trials). This allowed us to determine when in the trial neural activity encoded the identity of the sample versus the identity of the choice. This distinction is difficult to make without analysis of error trials, because in correct trials the sample and choice levers perfectly predict one another. Given that the decoder for error trials is trained on correct trials only, a significantly lower than chance level decoding accuracy for error trials means higher than chance level encoding of the choice lever. The accuracy of decoding error trials was high towards the beginning of the delay period, quickly dropped and stayed at chance level throughout most of the delay period, and fell below chance near the choice lever press time (Figure 6B). This means that neural activity around the time of the sample lever press encodes the sample lever identity, as opposed to the rat’s future choice. 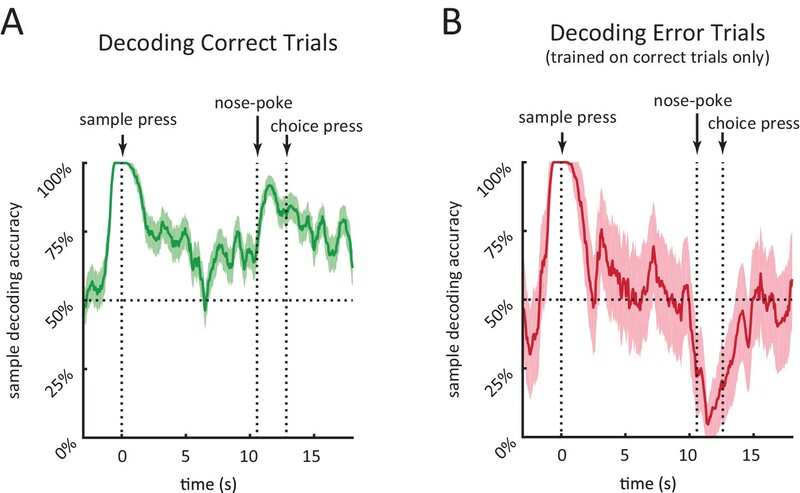 In contrast, at the time of the choice lever press, neural activity encoded the identity of the choice lever, as opposed to the sample identity. Performance of population decoder for sample lever identity. (A) Accuracy of decoding sample lever from population spiking data within a 0.5 s-wide sliding window in 10 s-delay correct trials. Decoder was trained on 10 s-delay correct trials and evaluated using leave-one-out cross validation. (B) Same as A but decoding 10 s-delay error trials. Decoder was trained on all 10 s-delay correct trials. In both panels, the dotted lines marked with'nose-poke' marks the median time of nose-poke, and the dotted line marked as 'choice press' marks the median time of choice press. Shaded area represents ± 1 SEM. Given that rats are allowed to move freely during the delay period, we considered the possibility that sample encoding early in the delay period (Figure 5B and Figure 6) may simply be a result of encoding of different positions/motor actions across left and right sample trials. To address this, we examined a time point during the delay period during which the movement trajectories converge for left and right sample trials. Following the sample press, rats typically move to the opposite wall and wait in front of the nose port for the delay period to end (Figure 1—figure supplement 1A). Instead of aligning trials to the beginning of the delay period (i.e. the sample lever press), we aligned trials to the moment the rats first arrived at the nose port, and excluded the small subset of trials in which they left the nose port within 1.5 s of the nose port arrival. We show that head position is very similar across left and right sample trials following nose port arrival (Figure 6—figure supplement 1A), yet our population decoder was able to decode the sample stimulus with high accuracy, even during the first 1.5 s when the rat strictly maintains its head position in front of the nose port (Figure 6—figure supplement 1B). This is important as it provides evidence of memory encoding within striatal neurons during the delay period while controlling for the rats’ position on left versus right sample trials. In an alternative approach to determine if the sample memory is present in DMS activity in a form beyond encoding of position/locomotion, we sought to test how well the sample stimulus can improve predictions of firing patterns when including other variables as predictors. Towards this end, we modeled each neuron's spiking activity using two generalized linear models (GLMs), one with position/locomotion related predictors only and the other with both task-related and position/locomotion related predictors. The position/locomotion predictors we used were head position, head direction, and head velocity and the task-related variables were time from delay period onset, sample stimulus of current trial, and the interaction between time and sample stimulus. We performed a nested model likelihood ratio test for each neuron to compare the two models, to determine if the addition of the sample memory related variables improved the model (see Materials and methods for details). For more than 90% of neurons (95/105), the model significantly improved when including the sample memory related variables (p<0.0001; Pearson’s chi-squared test). These neurons included 51 of the 53 sample encoding neurons identified through the mutual information analysis (Figure 5B–C). As a final approach to address position differences between left and right sample trials, we considered the possibility that differences between the left-sample and right-sample spiking patterns may be due to the fact that the rat is simply in different locations or performing different actions in the two conditions. In order to determine if neurons are encoding the identity of the sample lever rather than motor actions or location in the chamber, we took advantage of the task design in that the rats performed the same lever pressing action at the same location but in different contexts of the task, i.e. either in the sample phase or the choice phase. More specifically, if striatal neurons only encode the action or the location, we would not to expect to see differences in the neural coding for sample lever presses and choice lever presses. Note that the rats’ head position is very similar at the time of sample and choice lever presses (Figure 7A). Context-dependent neural encoding of the lever press. (A) Left plots show similarity of head position during left lever press for sample lever press (top) and choice lever press (bottom). Right plots are same as left plots except for right lever press. Average head position occupancy-maps from 250 ms before to 250 ms after the lever press. Occupancy-maps were generated by averaging individual occupancy-maps of all 9 rats (0.5”×0.5” tiles covering the 9.5”×12” chamber). (B) Firing rates of an example neuron during sample lever press and choice lever press. This neuron displays an obvious difference in its encoding of lever side between the sample and choice presses. (C) Neurons differentiate between sample and choice presses in the amount of information conveyed about the lever identity. Each neuron’s information about lever side was calculated by taking the mutual information between lever identity and spiking patterns within a 500 ms time window centered at the lever press (to match time window used in panel A). Orange circles represent sample lever information plotted against choice lever information. Green circles are obtained by recalculating the information after shuffling sample and choice labels for lever presses. Insets are histograms of choice information minus sample information for non-shuffled data (orange) and shuffled data (green). Neurons showed significantly greater difference between sample and choice information than expected by chance (p<10–6; two sample F-test for equality of variance for (sample information – choice information) in shuffled versus non-shuffled data). We found that many neurons differentiate between sample and choice presses in their encoding of lever identity. For instance, the example neuron in Figure 7B responds to right sample presses but not right choice presses. Such a dramatic difference cannot be explained merely as a result of encoding of motor actions, location, or body position since the rat performs the same action at a similar location but we observe very different neural responses. Much like the example neuron in Figure 7B, across the population of recorded neurons, some neurons preferentially encoded lever identity during the sample press while others encoded the lever identity during the choice press (Figure 7C). There was significantly more dispersion in the difference between sample and choice information than expected by chance (inset in Figure 7C, p<10–5; two sample F-test for equality of variance for (sample information – choice information) in shuffled versus non-shuffled data). This analysis supports the conclusion that DMS firing patterns are not merely reflecting position or motor actions. We characterized neural dynamics in the DMS during spatial working memory and found that neurons were sequentially activated throughout the course of the delay period. The sequential activity was dissociated from memory-encoding activity, which was present in the same neurons, but tended to occur earlier in the delay period. In other words, the time that a neuron most strongly encoded the sample stimulus during the delay period was not predictive of the time that it was most active. We employed two different methods to quantify the encoding of the sample stimulus during the delay period. The first method was to quantify the mutual information between the sample stimulus and the firing patterns for each individual neuron (Figure 5B), which revealed strong sample stimulus encoding at the onset of the delay period and less encoding during the delay period. The second method (Figure 6A) was to measure our ability to decode the sample stimulus from the entire neural population as a function of time during the delay period. The second method revealed perfect decoding accuracy at the onset of the delay period and greater than chance level accuracy during most of the delay period. Both approaches demonstrated that the sample stimulus is encoded strongly at the onset of the delay period and that stimulus encoding declines noticeably with either measure by 2 s into the delay period. Stronger stimulus encoding toward the onset of the delay period has been reported in studies of primate cortical regions, although those studies did not compare sample stimulus encoding to sequential firing activity (Brody et al., 2003; Bruce et al., 1985; Clark et al., 2012; Colby et al., 1996; Gregoriou et al., 2012; Romo et al., 1999). Our experiments differed from most previous work in that we employed relatively long delay periods (up to 10 s). Considering that sample information in the DMS decreased substantially within several seconds (Figure 5B and Figure 6A), the transient nature of stimulus encoding would have been less obvious if our task had only employed substantially shorter delay periods. Instead, the activity would have been better described as sustained memory-encoding activity. Indeed, previous recordings in primates have reported sustained delay period activity that encodes short-term memory in a subset of caudate neurons with delay periods of 2–4 s (Hikosaka et al., 1989; Kawagoe et al., 1998; Schultz and Romo, 1988; Schultz et al., 1994). In our study, we observed some neurons with stimulus encoding during the delay period that persisted for several seconds, in agreement with prior work. However, no single neuron was found to encode the sample stimulus for the entire duration of the delay period (Figure 5B). A strength of our task design is that it allowed us to compare the same motor action (i.e. lever pressing) in different contexts within the trial (Figure 7). This revealed that striatal neurons differentially encode the sample press and the choice press, and that encoding of the same action is dependent on the context of the action within the task. This supports the idea that the striatum is involved in encoding memories of task-related variables, and not merely encoding the rats’ position or movement during the task. Unlike most prior work performed in head-fixed primates, our rats were freely moving. Thus, we performed several analyses to control for the possibility that our conclusions of sequential firing rate activity or transient stimulus encoding was a result of motor or position confounds. This included analyzing data from times that the rat was in the nose port (Figure 4—figure supplement 2A–D and Figure 6—figure supplement 1), as well as showing that task-relevant variables remained a significant predictor of neural activity in the vast majority of neurons, even when accounting for movement or position with a generalized linear model (GLM). However, motor and position confounds may have been even more strongly excluded had we instead used a task design that restricts movement of the rat during the delay period. Additionally, in our task design the correct choice of a trial can be determined from the onset of the delay period, making it difficult to distinguish encoding of the memory of the sample stimulus from encoding of future motor actions ('retrospective' versus 'prospective' memory). A more sophisticated task design that enabled dissociation of stimulus encoding and pre-motor activity could have allowed us to make even stronger conclusions about memory encoding. Different theories have been proposed to explain how the striatum contributes to working memory. For example, it has been suggested that the striatum may be involved in initiating the storage of new memories in cortical networks, an idea often referred to as 'gating' (Baier et al., 2010; Frank et al., 2001; Gruber et al., 2006; O’Reilly and Frank, 2006; Braver and Cohen 2000). According to this idea, the striatum plays a role in selecting cortical memory buffers that are to be updated and determines the time memory updating occurs, similar to the role the striatum is thought to play in initiating and selecting motor actions (Bailey and Mair, 2006; Bhutani et al., 2013; Grillner et al., 2005; Kropotov and Etlinger, 1999; Mink, 1996). The gating model ascribes a crucial role to the striatum at the onset of the delay period, when new information must be stored in short-term memory buffers (Baier et al., 2010; Frank et al., 2001; Gruber et al., 2006; O’Reilly and Frank, 2006; Braver and Cohen 2000). Interestingly, our data emphasizes the importance of the striatum at the beginning of the delay period, as the stimulus is most strongly encoded during that period. However, another possibility is that DMS is contributing to maintaining the short-term memory. Although the accuracy of our population decoder decreases substantially during the course of the delay period, the decoding accuracy near the end of the delay period is roughly comparable to behavioral performance even at the 10 s delays (Figure 1C and Figure 6A), indicating that activity in the DMS might be sufficient to support the animal’s behavior. As another possibility, the DMS could assist cortical areas in maintaining the memory throughout the delay period, irrespective of holding the content of the memory. Memory encoding activity in cortex often appears as persistent elevated activity or sequential activations of neurons (Baeg et al., 2003; Cromer et al., 2011; Fujisawa et al., 2008; Fuster and Alexander, 1971; Hanks et al., 2015; Harvey et al., 2012; Horst and Laubach, 2012; Kojima and Goldman-Rakic, 1982; MacDonald et al., 2013; Pastalkova et al., 2008; Powell and Redish, 2014; Schoenbaum and Eichenbaum, 1995), which may be implemented using positive feedback through distributed cortico-striato-thalamic loops (Alexander et al., 1986; Houk and Wise, 1995; Middleton and Strick, 2000, 2002; Wang, 2001). In this view, the sequential activity that spans the delay period in DMS could play a role in exciting cortical memory buffers and enabling memory encoding activity there. As yet another possibility, the stimulus memory may be stored in the striatum in a form that would not be fully detectable in the spiking activity, perhaps in short-term synaptic plasticity, as suggested by recent theoretical models (Lundqvist et al., 2010; Mongillo et al., 2008; Stokes, 2015). Future experiments employing transient perturbations of the striatum at sub-trial temporal precision will help address the question of whether the DMS is more important for initiating versus maintaining memories. Sequential neural activity dynamics have been reported in the striatum in tasks that do not involve spatial working memory (Lustig et al., 2005; Matell and Meck, 2000, 2004; Mello et al., 2015). These studies, taken together with our finding that firing rate sequences we observed here were dissociated from stimulus encoding activity (Figure 5B,C), suggests that the delay-period spanning sequences in DMS support a general role for the striatum in time keeping, rather than a specific role in working memory. On a related note, the neural dynamics we observed in the DMS underlying spatial working memory provide an interesting contrast with previous observations of sequential activity dynamics in other regions during spatial working memory. In particular, cortical (Astrand et al., 2015; Cromer et al., 2011; Crowe et al., 2010; Fujisawa et al., 2008; Harvey et al., 2012; Horst and Laubach, 2012) and hippocampal (MacDonald et al., 2013; Pastalkova et al., 2008) areas display stimulus encoding sequences that span the delay period. This suggests a different role for the striatum in working memory relative to these other regions. Specifically, cortex and hippocampus may be involved in maintaining the memory throughout the delay period, whereas the striatum may be involved in initiating memory storage. We employed information theoretic analysis and population decoding to reveal that sequential activity and stimulus encoding are dissociated in the neural dynamics of the striatum during spatial working memory. Specifically, neurons transiently encoded the stimulus during the onset of the delay period, whereas the same neurons encoded time with sequential activity throughout the delay period. Male Long Evans rats (7 for infusion experiments and 9 for recordings) were trained on a delayed non-match to position (DNMP) spatial working memory task in operant chambers (Figure 1A,B). There were two retractable levers on the operant chamber front wall (right side of schematic and heat-maps, Figure 1B). At the beginning of each trial, a sample lever extends out of the wall, (either on the left or the right side – randomly interleaved). The rat is then required to press that lever, after which the lever retracts back into the wall. The rat has to remember the sample lever side for the duration of the delay period (1 s, 5 s, or 10 s – randomly interleaved). The end of the delay period is signaled by the illumination of the nose port on the back wall of the chamber (left side of schematic and heat-maps, Figure 1B). The rat must then poke his nose into the illuminated nose port for both levers to extend from the front wall of the chamber, and then choose one of the two levers. Following a correct lever press, i.e. a choice lever press that does not match the initial sample lever, the rat is rewarded with 40 μl of milk in the reward receptacle (Figure 1A,B). The rats were given 30 s to respond to the sample lever, 5 s to respond to the activated at the end of the delay period, and 5 s to respond to the choice lever. An incorrect lever press or a failure to respond within the time limit, resulted in a 5 s time-out penalty, during which the house-light is turned off. Trials were followed by 10 s long inter-trial interval (ITI). The task was designed to encourage the rats to spend the delay period at the nose port. Tracking of head-position confirmed that rats spent the majority of the delay period in the nose port (Figure 1B center panel and Figure 1—figure supplement 1A). The rats were kept on a limited food diet to motivate behavior. All procedures were performed in accordance with the university-approved IACUC protocol. For the cannula implantations, 12 adult Long Evans rats (>300 g) that were previously trained in the DNMP task were deeply anesthetized and a double guide cannula was implanted bilaterally above the dorsomedial striatum (DMS) (A/P: 1.2 mm, M/L: ± 1.9 mm, D/V: −5.25 mm, taking into account the 1.25 mm or 2.75 mm projections of internal cannulas used during injections). For the electrode implantation, 9 adult Long-Evans rats (>300 g) that had previously undergone training in the DNMP task were deeply anesthetized and electrode arrays were implanted either unilaterally or bilaterally over the DMS. The implants were omnetics based TDT micro-wire arrays, composed of 1–2 rows of 8 polymide insulated tungsten wires (50 μm diameter, with 175 μm spacing within a row and 500 μm spacing between rows). The DMS was targeted stereotactically (A/P: 1.2 mm, M/L: ± 2.0 mm, D/V: −4.0 to −5.0 mm) and electrodes were oriented so that the length of the rows went along the anterior/posterior axis. A ground screw was implanted in a posterior location on the skull and connected to the ground wire from the array. After a week of recovery time post-surgery, the rats were retrained on the DNMP task until behavior re-stabilized. Before each testing session, rats were anesthetized in an induction chamber and were then moved to a nose cone to maintain anesthesia (with 2% isoflurane) for a total duration of 20–25 min. During this period the cap and dummy cannulae were removed and internal cannulae with appropriate projection length were inserted into the guide cannula. 600 nl of saline or muscimol solution was infused at a rate of 200 nl/min. The internal cannula was removed and dummy cannulae were inserted 4 min after each infusion, to allow the solution to diffuse. Rats were given 20–25 min of recovery time after the infusion and anesthesia, before being placed in the operant chamber to begin behavioral testing. To identify the muscimol concentration that was used for testing each rat, a range of muscimol infusion concentrations (37.5–75 ng) was tested on different days, and the largest concentration for which each rat performed a sufficient number of trials during a session was identified (at least 50 trials per session). Once the concentration was identified, the rats underwent two days of additional infusion sessions. On the first day they received an infusion of saline, and on the second day they received an infusion of the muscimol concentration selected as described above. Concentration and volume were similar to values used in previous studies (Spencer et al., 2012; Yin et al., 2005). Of the 10 implanted rats, 3 rats were not included in the final data set. One rat became sick over the course of the study. One rat did not perform the task under the range of muscimol concentrations that we infused. And one rat had a brain infection that was evident in the post-mortem histology analysis. After a week of recovery time, the rats were retrained on the DNMP task while simultaneously being habituated to having wires connecting the implant arrays to the TDT 32 channel recording system through a motorized commutator. After two weeks of retraining and habituation, each rat underwent a single recording session of 1.5–3.5 hr in, in which 200–520 trials were recorded. All head tracking data was obtained by using the TDT RV2 system, linked to a camera directly above the chamber. The RV2 system was trained to detect two LEDs mounted on top of the rat head stage (one green and one red). Linear interpolation was used to fill in the gaps for the periods when the signal was lost for either of the LEDs. To determine when a rat was 'at the nose port' (Figure 4—figure supplements 1–2 and Figure 6—figure supplement 1) we first found the median head position coordinates for when the rat made nose pokes. Whenever a rat was within 2.5” of that position, that rat was considered to be 'at the nose port'. First nose port arrival time was calculated accordingly. After the recording experiments, under deep anesthesia, electrolytic lesions were generated at each electrode tip to enable the locations of the electrode tips to be visualized. Immediately after the lesions were generated, the rats received a transcardial perfusion of PBS followed immediately by perfusion of 4% PFA in PBS. Brains were place in 4% PFA in PBS solution for 24 hr. Then they were transferred to a solution of 30% sucrose in PBS. 40um thick sections were generated with a microtome. The relevant DMS slices were stained with DAPI and the lesions were visualized with a stereomicroscope (Leica). Spikes were detected online with amplitude thresholding. Clustering was performed manually using Plexon Offline Sorter. Any cluster that was clearly distinct from the noise cluster with reasonable spike amplitude/waveform and inter-spike interval histograms was identified as a single unit. The firing rate heat-maps (Figure 4B, Figure 5B, and Figure 4—figure supplement 2) were generated by fist binning spike times relative to the specified event marker and calculating average firing rate in each time bin (calculated by averaging the histograms for left and right sample trials). The z-scored firing rate was calculated based on the mean and standard deviation of the firing rate from 50 s before to 50 s after the event. To statistically test the presence of sequences in firing activity, we use the ridge-to-background ratio, an approach previously introduced by (Harvey et al., 2012). For each neuron, we first calculate the average firing rates for each time bin relative to delay onset (using 0.1 s time bins). Ridge activity is the mean firing rate of the 11 bins (a 1.1 s-wide window) centered at the peak activity time. Background activity is defined to be mean firing rate of all the other time bins. We used a large window for calculating background activity, i.e. from 50 s before to 50 s after the aligning point. In Figure 4—figure supplement 1B those time bins that were masked were not included in the background activity calculation or ridge activity calculation. We tested the statistical significance with a one tailed test comparing the ridge-to-background ratio against the null distribution of ratios expected by chance. The null distribution was calculated by repeatedly circularly shifting spike times by random values. In Figures 4B,C, and Figure 4—figure supplement 2E, firing activity peaks were selected from 1 s before the onset of the delay period to 1 s after the end of the delay period. In Figure 4—figure supplement 2F firing activity peaks were chosen from 5 s before to 15 s after the desired event. Likewise, the ridge-to-background analysis in Figure 4—figure supplement 1C was carried out on a time window spanning 5 s before to 15 s after the desired event. For all other heat-maps (Figure 5B and Figure 4—figure supplement 2A), scatter plots (Figure 5C and Figure 4—figure supplement 2B), and ridge-to-background ratio analyses (Figure 4—figure supplement 1B) firing activity peaks were chosen from the onset to the end of the delay period. To calculate mutual information as described below, as well as to display time-varying firing rates for example neurons (Figure 4A and Figure 5A), the firing rates (calculated with bins of 50ms) were smoothed by convolving with a Gaussian kernel (σ = 1/6 s). And the term on the right can be calculated from the estimated firing rates in the case <sample> = x. To determine if mutual information peaks are statistically significant, we compared mutual information peaks from the data to that obtained with shuffled data (Panzeri et al., 2007). Towards this end, we randomly shuffled the left sample and right sample trials and recalculated time-varying sample information using the approach explained above. For each neuron, this process was repeated 200 times and the maximum value of sample information within the delay period was taken each time, to obtain a distribution of the sample information peak value expected by chance. The peak information of the non-shuffled data was compared to that distribution to test for significance (p<0.01, one-tailed test). All neurons with peaks larger than the 99th percentile of the shuffled distribution were considered to be significantly encoding the sample stimulus (Figure 5B). The green shadings on the bottom panels of Figure 5A are the thresholds for significance of the peak value across the entire delay period interval, obtained by taking the 99th percentile of distribution for sample information peak expected by chance. Information about lever identity for choice and sample presses was calculated in a similar fashion, with the modification that we did not use a sliding window, but rather calculated for the entire 500 ms window centered at a lever press (Figure 7C). The term on the right can be calculated using the Poisson probability mass function and the spike rate of the corresponding bin under condition <sample>=x. We train the sample decoder by calculating time-varying firing rates for left sample and right sample trials separately, from the training data set. The sample decoder knows what time segment of the trial the spike train belongs to and uses firing rate estimates from that segment. Decoder is trained using correct trials only (i.e. trials in which the rat responded by choosing the correct lever). Since the neurons were not all recorded simultaneously from the same rat, we randomly combined different trials from each neuron with one another into pseudo-trials. Trials were drawn with replacement, within a determined condition of the four trial conditions (i.e. [left sample, right sample] × [correct, incorrect]). 500 pseudo-trials were generated. The error bars in Figure 6 are the SEM determined by the number of pseudo-trials if trials were drawn without replacement (i.e. the minimum number of trials for a specific condition across neurons), which is an upperbound on the SEM. Generalized linear models (GLMs) were constructed to predict the number of spikes of each neuron in each 10 ms time bin using various predictors related to the task and the animal’s behavior. The GLMs modeled number of spikes with a Poisson distribution and a log link function). Positional predictors included: 9 binary predictors for head position, 8 binary predictors for head direction, and 3 numerical predictors for velocity (x component, y component, and magnitude of velocity vector). For the head position predictors, the chamber was divided into nine tiles (3 equal segments along each axis) and each binary predictor represented whether the head position was located in the corresponding tile. For the head direction predictors, the range of possible head directions (0–360 degrees) was divided into 8 equal segments and binary predictors for head direction represented which segment the head direction was in. For the task related predictors, the 10 binary predictors denoted time within the delay period and one binary predictor denoted the identity of the sample stimulus. For the time related predictors, time from delay onset was divided into 1 s long time bins and each of the 10 binary predictors signified whether the current time was in the corresponding 1 s time bin. Nested Model Comparison of GLMs were performed by first fitting the GLM to the data using R function glm() and then performing a likelihood ratio test using the R function anova (model1, model2, test = 'Chisq'). On the control of control: The role of dopamine in regulating prefrontal function and working memory, Attention and Performance XVIII. Progress in Brain Research 169:323–338. Journal of Cognitive Neuroscience 23:3355–3365. Cognitive, Affective, & Behavioral Neuroscience 1:137–160. Frontiers in Computational Neuroscience 3:21. Journal of Computational Neuroscience 20:153–166. International Journal of Psychophysiology 31:197–217. European Journal of Neuroscience 19:755–760. Neuroscience and Behavioral Physiology 11:164–169. Annual Review of Neuroscience 26:381–410. Frontiers in Behavioral Neuroscience 8:120. Journal of Comparative and Physiological Psychology 49:365–372. In: G Percheron, J. S McKenzie, J Féger, editors. The Basal Ganglia IV. Springer US. pp. 305–313. Frontiers in Integrative Neuroscience 4:12. Journal of Comparative and Physiological Psychology 67:535–546. Trends in Cognitive Sciences 19:394–405. Thank you for submitting your article "Dissociated sequential activity and stimulus encoding in the dorsomedial striatum during spatial working memory" for consideration by eLife. Your article has been reviewed by three peer reviewers, and the evaluation has been overseen by Naoshige Uchida as the Reviewing Editor and Timothy Behrens as the Senior Editor. The following individual involved in review of your submission has agreed to reveal their identity: Earl Miller (Reviewer #2). The reviewers agreed that the authors have been very responsive to the reviewers' previous comments. In particular, the new inactivation experiment is important, and the authors added useful analyses to address the previous concerns. While the manuscript has improved significantly, the reviewers still raised some issues that need to be addressed before publication in eLife. 1) The decoding analysis shows that the neuronal activity contains sample information later in the delay (10 sec). Although the decoder performance is lower than that at the onset of delay period, the decoder performance is comparable to the behavioral performance (Figure 6A). This would mean that the striatal activity at the end of delay period can provide sufficient information to support the animals' behavioral performance. This contradicts the authors' claims. We would like to see more robust discussions on this limitation in the conclusion in Discussion. 2) The authors discuss sequential activity throughout the manuscript but in some places, the existence of sequential activity is not very obvious (e.g. Figure 4—figure supplement 2). The correlation analysis that the authors performed might be problematic if correlations were drawn by a few outlier points. It would be helpful if the authors come up with a statistical way to quantify 'sequenceness' more directly. For instance, this may be achieved by looking at the rank in time of neurons recorded simultaneously across single trials. 3) In the inactivation experiment, it is important to report other behavioral measures to know whether DMS inactivation had other effects. Please report whether the range of doses used in the current experiment affected trials performed, time between trials, and other measures that can extracted. 4) The current task design may not be ideal for examining sample stimulus encoding during delay period. The authors have done a nice job of analyzing the data given what was done but some of the motor/place confounds can be more clearly excluded by the use of a more controlled task design. The authors now discuss their task design as having various advantages in Discussion but it would be useful to also point out disadvantages compared to other working memory paradigms commonly used in non-human primates and some rodent studies (e.g. block or randomly interleaved designs to dissociate sample stimulus from motor/place parameters). Please add some discussions on the limitation of the current task design with respect to strongly drawing conclusions on sample stimulus encoding. Thank you for submitting your work entitled "Dissociated sequential activity and stimulus encoding in the dorsomedial striatum during spatial working memory" for consideration by eLife. Your article has been reviewed by three peer reviewers, and the evaluation has been overseen by Naoshige Uchida as the Reviewing Editor and Timothy Behrens as the Senior Editor. Our decision has been reached after consultation between the reviewers. Based on these discussions and the individual reviews below, we regret to inform you that your work will not be considered further for publication in eLife. Previous studies have suggested that the striatum, in particular the dorsomedial striatum (DMS), may play a role in working memory. However, the mechanism by which the DMS is involved in working memory is not understood. The authors characterized firing patterns of DMS neurons in rats performing a delayed non-match to position (DNMP) task. The authors observed transient activation of neurons when the rats initiated a delay period by a nose poke. The authors also show that neurons were activated sequentially throughout the delay period. The main conclusion is that the activity at the onset of the delay period conveyed information about sample lever presses, the content of working memory, whereas the sequential activity did not. The authors suggest a possibility that the DMS is involved in working memory by gating information only at the early phase of working memory. The reviewers find the main finding very interesting. However, during discussions as well as in the review comments, their enthusiasm differed significantly. Two reviewers were concerned about the possibility that the sequential activity as well as the transient activity at the beginning of the delay period are related to the movement or position of the animal and not directly related to working memory itself. The reviewers understood that the authors are not claiming that the sequential activation conveys information about working memory contents, but pointed out two problems. First, the data in Figure 6A shows that the information about sample lever presses are present throughout the delay period, so this contradicts with the analysis using mutual information. Second, what is causing the sequential activity remains unclear (i.e. is it really related to working memory, or other motor or place parameters?). The reviewers thought that the sequential activity is very interesting regardless of what it relates to. However, they thought that, to address these issues, more thorough analysis on behavior during the performance of the task is necessary although the task design appears to make it difficult to dissociate confounding factors completely. Another important issue is that it remains to be established whether the firing difference at the onset of the delay period is due to the content of working memory. The reviewers thought that showing that more information is available in neural activity when type of lever press (sample versus choice lever press) is specified is not sufficient to demonstrate this point. The study by Akhlaghpour and colleagues reports interesting data on ensemble activity in the striatum during a delayed non-matching to position task. The methods for data acquisition and analysis are more than adequate to address the target issues of the manuscript. However, several issues in the behavioral design reduced my enthusiasm for the paper, and really should be addressed before it is considered for publication. First, can the authors show that perturbing sequential activity in the striatum alters the animals’ performance of the task in a way that is predicted by the striatum participating in working memory? You may not have data (yet) on this, but it would make the paper much stronger. Second, the task that was used is somewhat limited in being able to find evidence for working memory given that only two options are presented to the animals. Despite this limitation, the study is still interesting and could provide novel insights into striatal function if two major issues are addressed. Major challenges for this research are (1) to dissociate the sequential activations that are reported from positional and locomotor behaviors that could be the true generators of the sequential activations and (2) to demonstrate that the sequential activations do not occur in a sensory-guided version of the task (for example, using visual cues). Resolving these issues are most important for establishing the validity of the authors' interpretations. Also, how do the sequential activations relate to the persistent activity reported by Schultz and colleagues in early primate recordings in the striatum. They never referred to those activity patterns as working memory, but did claim to find such activations to be quite common within the striatum. Why do you think that you did not find such activities in your study? (I think that it is because your rats were freely moving and there were many behaviors that could influence the striatal neurons during the delays between responses.) I think that you should comment on this issue in the Discussion. This manuscript studies the relationship between sequential activity in the striatum and the code for spatial working memory using a DNMP task and electrical recordings. The paper is clearly written and clearly presented. The topic investigated is an interesting one. The analyses for the most part appear carefully performed and well done. I have one major concern relating to how well the authors can relate the activity they observed to working memory rather than other task variables, such as motor actions. This concern made it difficult for me to be convinced that the dissociation the authors propose, between sequential activity and working memory, is strongly supported. Without improvement in this area, I think the main conclusions cannot be stated with high confidence. 1) I am not convinced the authors have clearly shown that working memory activity is encoded in the population of striatal neurons recorded. The evidence for working memory activity is that there is mutual (MI) between the sample lever identity and firing rates during the delay period and that the decoder can read-out above chance levels the identity of the sample lever during the delay. However, it seems that another possibility is that the rat performs different actions following a left and right sample lever press and that the activity is related mostly to different motor actions on different trial types, rather than working memory. The encoding of motor actions might be reasonable for explaining why the MI is the highest at the start of the delay because the rat likely moves very differently away from the right and left levers. In addition, the decoder performance for sample lever identity is highest at the times during which the motor actions for the different sample lever trial types is most distinct, namely right after the sample lever press and during the response lever press (which involves different levers on correct trials for different samples). This point is consistent with the decoding of sample lever identity on error trials based on training the decoder on correct trials: the decoder performance is near perfect at the sample lever press and near zero at the response lever press. The one argument against this hypothesis is that presses of the same lever have different neural activity during sample and response periods. However, there are likely many different motor actions occurring in these cases, such as anticipatory licking during the response but not sample period or different body actions and orientations based on entrance into the port. Given the striatum's known role in driving motor actions, it seems that a perfectly valid interpretation of the data could be that the striatal firing is related to motor actions and is not related to working memory at all. With the current presentation of the behavioral data, it is impossible to understand if this alternative hypothesis can be excluded. Therefore, I think more needs to be done to rule out the possibility that what the authors consider to be working memory signals are simply reflections of motor action differences of the rat on right and left sample lever trials. I acknowledge that this is a potentially never-ending source of additional analyses and measurements if all possible motor actions are considered. However, it seems like more could be done with the current data. Some straightforward plots and analyses could go a long way in helping the reader on this topic. Do the rats have different movement patterns following right and left sample lever presses? The authors could plot movement trajectories at various time intervals after left and right sample lever presses and also at various time intervals preceding left and right response lever presses. These trajectories could be supported and summarized using heat maps for occupancy during left and right sample trials at various time points, as used currently in Figure 1. In these analyses, a marking of time and trajectories is critical, which is currently absent in Figure 1 heat maps. In addition, the authors could use classifiers or decoding methods to determine if they can predict whether the sample lever pressed was left or right based on the rat's position, heading direction, movement speed, and all other behavioral parameters they have measured. This classification analysis could be performed as a function of time from sample lever press. Can the authors decode movement-related signals from the striatal firing, such as current movement speed or upcoming actions (changes in heading direction)? If these signals exist, then it is possible that these signals are the dominant factors during the delay period. If the authors can decode things like current or upcoming movements from striatal firing, then they can ask if the types of decoded movements differ on left and right sample lever press trials. These points are essential to the paper because if the authors want to say that working memory information is encoded and separable from the sequential activity, then it is critical to be very confident that the working memory signal is actually present in a form beyond motor actions. 2) The authors include only a subset of neurons for the analysis of MI in comparison to firing rate peaks. The inclusion criterion is whether at any point the MI goes above 99% of the shuffled MI values (p value of 0.01). I think the authors are doing many comparisons (many timepoints) per neuron for this MI significance test; however, they have not done a multiple comparisons correction. If the authors perform many comparisons in each neuron, then a multiple comparisons correction is needed, such as a Bonferroni correction. Without such a correction, a significant false positive rate, well above 1%, is expected. This is a straightforward and well-written manuscript describing neural dynamics in the striatum or rats performing a spatial working memory task. The task is a classic and the analyses and results convincing. The intriguing aspect of the results is that striatal neurons fire and different points in the delay such that peaks in spiking are spread throughout the memory delay. There is an interesting dissociation, however, peaks in information about the remembered sample occur at the beginning and end of the delay and thus does not line up with the peaks in firing. I don't really have any major concerns. Just suggestions for improvement. The authors rightly (as far as I know) point out that these results are unique in the rodent literature and likely made possible by the use of a 10 sec delay. However, there have been similar results reported in the primate cortex. For example, the peak of information at the beginning and end of the delay is seen quite commonly in the primate prefrontal and parietal cortex. I encourage the authors to look at this literature and cite some relevant studies. Likewise, the sequential nature of activation in the delay has also been reported in primate prefrontal cortex, albeit for information. For example, check out Figure 4 of Cromer et al. 2011, J. Cog. Neuro. I think the authors should acknowledge and discuss this. And also, they need to be a little more cautious in their conclusion that the 10 sec delay was necessary. It may be in rodents, but not primates. It is interesting that primate cortex shows sequential information whereas rodent striatum less so. And interesting means worth mentioning. Finally, there is an emerging class of working memory models that suggest that working memories are not encoded by sustained activity but instead by transient changes in synaptic weights induced by spiking activity. For example, consider Lunqvist et al. (2010, 2011, 2012) and the "activity-silent" models of Stokes. The result here seems to support this class of models seeing that activity isn't sustained across the delay. I think at this point should be raised. Thanks for the clarification. We now point out in the Discussion that although much higher levels of information and decoding accuracy are available in DMS neural activity towards the onset of the delay period, the decoding accuracy remains above chance for much of the delay period, at a level that is roughly comparable to the behavioral performance. This means it is possible that information within DMS is used for maintaining the shortterm memory. The only way to definitively address the question of whether DMS is more important for updating versus maintaining the memory is through future experiments involving fast timescale, subtrial manipulations, which could potentially distinguish on a causal level between these two possibilities (see subsection “Relevance to theoretical models of the striatal contribution to working memory” last paragraph). As an additional measure to quantify the presence of sequences in the firing rates, we now include the ridgetobackground analysis, an approach previously established for this specific purpose by Harvey et al., 2012. The ridgetobackground analysis takes ridge activity (defined as average activity in a fixed time window around the peak firing rate time) divided by background activity for each neuron, and statistically compares this ratio in the real data to a null distribution which is obtained by repeatedly shifting spike times in the behavioral session. As expected, we found that the ridgetobackground ratio was significantly above chance levels across all conditions presented in the paper (see Figure 4—figure supplement 1). To supplement the accuracy and latency measures reported in Figure 2, we now report the effect of muscimol on the number of trials performed, sample omission rates, trials abort rates, sample bias, and choice bias (see Figure 2—figure supplement 1). Unlike accuracy, none of these other measures were significantly affected by muscimol across the population of rats (n=7). However, a few of the rats did seem to perform fewer trials with DMS inactivation (with more sample omissions and more trial aborts), which is consistent with DMS being implicated in motivation or response vigor (Wang et al. 2013). Even if this effect were to become statistically significant across a larger population of rats, our conclusion stands that silencing of DMS activity impairs accuracy in the delayed nonmatch to sample task for trials that are completed. Thank you for noting this. We have added a paragraph to the Discussion on the limitations of our task design. Motor confounds may have been more strongly excluded had we used a task design that restricts the movement of the rat during the delay period. Additionally, our task makes it difficult to distinguish between motor planning and sample stimulus memory because the correct choice lever can be determined from the beginning of the delay period (see subsection “Insights into the striatal dynamics underlying working memory” third paragraph). […] The reviewers find the main finding very interesting. However, during discussions as well as in the review comments, their enthusiasm differed significantly. Two reviewers were concerned about the possibility that the sequential activity as well as the transient activity at the beginning of the delay period are related to the movement or position of the animal and not directly related to working memory itself. The reviewers understood that the authors are not claiming that the sequential activation conveys information about working memory contents, but pointed out two problems. First, the data in Figure 6A shows that the information about sample lever presses are present throughout the delay period, so this contradicts with the analysis using mutual information. We appreciate the thorough attention to the details of our results. Regarding the potential discrepancy between Figures 5B and 7A (previously 4B and 6A), the two panels were generated using two different methods to quantify the encoding of the sample stimulus during the delay period. Our first method (Figure 5B) was to quantify the mutual information between the sample stimulus and the firing patterns for each individual neuron, only including the units with significant sample information peaks. That method revealed strong encoding at the onset of the delay period and very little encoding during the delay period (only a few neurons appear to encode the memory of the sample stimulus above 0.2 bits later in the delay period). Our second method (Figure 7A) was to measure our ability to decode the sample stimulus from the entire neural population as a function of time during the delay period. The second method revealed perfect decoding accuracy at the onset of the delay period and greater than chance level accuracy during most of the delay period. Based on the Reviewer comment, we now appreciate that these two results may at first appear to contradict each other, since a small amount of sample information in a few neurons contributes to an abovechance level of sample decoding accuracy when using the population data. However, the takehome message from the two plots is the same: the sample stimulus is encoded strongly at the onset of the delay period and that sample encoding declines noticeably with either measure by 23s into the delay period. We briefly clarify this in the Discussion of the revised manuscript (subsection “Insights into the striatal dynamics underlying working memory”, first paragraph). Second, what is causing the sequential activity remains unclear (i.e. is it really related to working memory, or other motor or place parameters?). The reviewers thought that the sequential activity is very interesting regardless of what it relates to. However, they thought that, to address these issues, more thorough analysis on behavior during the performance of the task is necessary although the task design appears to make it difficult to dissociate confounding factors completely. Thank you for commenting that the sequential activity is very interesting, and for raising an important issue that needs to be addressed. To demonstrate that the sequences are not a byproduct of movement or position, we use the head tracking data and show that even when the rat’s head is in the nose port and therefore position is controlled for, the sequences are still present. This analysis is described in detail in our pointbypoint responses to Reviewer #1 below. Another important issue is that it remains to be established whether the firing difference at the onset of the delay period is due to the content of working memory. The reviewers thought that showing that more information is available in neural activity when type of lever press (sample versus choice lever press) is specified is not sufficient to demonstrate this point. We believe you have raised an important question regarding whether the sample encoding we observe at the onset of the delay period is in fact simply encoding of position or motor actions. To support our claim that the firing rate differences observed between left and right sample presses cannot be accounted for merely by position, motion, or motor actions, we compare neural correlates of the sample press with neural correlates of the choice press (Figure 7). In our revised submission, we do so by examining a much shorter time window around the time of the lever press (only ± 0.25s rather than ± 1s as in our original submission). This narrow time window was chosen based on examination of the head tracking data to minimize movement towards and away from the lever. Our analysis reveals that DMS neurons encode choice presses and sample presses differently. We provide details regarding this analysis in our responses to Reviewer #2 below. In addition, we now provide new analysis of sample encoding when the rats first arrived at the nose port, shortly after pressing the sample lever. In this case, we show that head position is maintained at a similar location for left and right sample trials. Yet we observe significant sample encoding (Figure 6—figure supplement 1). This further supports our claim that sample encoding during the delay period cannot be explained by the rats’ position and motion. Thank you very much for describing our data as interesting and for mentioning that the data acquisition and analysis are more than adequate. As you will see below, we have worked to address your concern about the influence of the subject’s movement and position on our conclusions through additional analyses and experiments. Thank you for the suggestion. We agree that this is a good experiment which would make the paper much stronger. To this end, we trained a new cohort of rats on the delayed nonmatch to position task and inactivated the DMS with bilateral infusion of muscimol. Infusion of muscimol in the DMS led to much lower accuracy when compared to infusion of saline (Figure 2, p < 1e6 repeated measures ANOVA, n=7 rats). The fact that rats press the incorrect choice lever more frequently when the DMS is inactivated suggests that the DMS activity contributes to spatial working memory in this task. We very much appreciate the suggestion to better account for positional variables in our analyses. We are confident that our paper is much stronger as a result of the analytical approaches that we describe below. To demonstrate that sequential activations cannot be explained by positional or locomotor behavior, we took two distinct and complementary approaches. In our first approach, we plotted the activity of DMS neurons only for the subset of time that the rat was at the nose port, effectively controlling for body position and locomotion. The rats spend the majority of the delay period positioned at the nose port, waiting for the end of the delay period (in Figure 1—figure supplement 1A). We recalculated the firing rate sequences using only the subset of time during which the rats were positioned at the nose port, thereby controlling for position (Figure —figure supplement 1AD). The firing rates were calculating by aligning spiking activity to delay period onset (Figure 4—figure supplement 2A, leftmost panel) or to time of arrival at the nose port (Figure 4—figure supplement 2C, leftmost panel). Time bins in which the rat was not at the nose port for a sufficient amount of time to calculate firing rates were excluded (masked in white in Figure 4—figure supplement 2A & Figure 4—figure supplement 2C; see Methods). As you can see below, there is a high degree of correlation in the time of peak firing calculated by only using data from when the animal was at the nose port versus using the entire dataset (Figure 4—figure supplement 2B for alignment to noseport arrival, r = 0.72, p < 106 Pearson correlation test; and Figure 4—figure supplement 2D for alignment to delay period onset, r = 0.36, p < 0.05 Pearson correlation test). This demonstrates that sequences were not simply neural correlates of position or locomotion, and occurred even when the rats remained at the nose port. In our second approach to demonstrate that sequential firing activity cannot be explained by position and locomotion, we used a statistical model to show that time in the delay period is a significant predictor of neural activity, even when taking into account the rats’ position/locomotor variables. What this means is that temporal fluctuations in firing rate that occurs during the delay period are not merely a byproduct of position/locomotion variables. More specifically, we modeled each neuron’s spiking activity using two generalized linear models (GLMs), one with position related predictors only (i.e. head position, head direction, and velocity – all calculated using head tracking) and the other with positionrelated predictors in conjunction with time from the delay period onset as a predictor. We demonstrate that time from delay onset significantly improves the model in 80% of the neurons (84/105) in comparison to a model with only the position/locomotor variables (p < 0.0001, likelihood ratio test comparing models with and without time from delay period as predictor). This demonstrates that the timedependent changes in firing rates during the delay period cannot be accounted for by position or the other variables we tested. (see Methods for more details on the model). Thank you for mentioning that it would be interesting to know if the sequences would occur in a sensory version of the task. Although we do not have this data, we do want to point out that our conclusions do not rest on the assumption that sequential activity would not appear in a sensory guided version of the task. In fact, we think it is likely that we would indeed observe sequential activity in a guided version of the task, given that we see sequential activation of neurons even outside the delay period (see Figure 4—figure supplement 2F). Furthermore, the presence of sequences in a sensory guided version of the task will not necessarily be informative as to whether these sequences are related to working memory. It could be that sequential activation enables working memory, but is nevertheless present in tasks that are not related to working memory. Thank you for raising this question. In the Discussion section of our new submission (subsection “Insights into the striatal dynamics underlying working memory”, second paragraph) we now elaborate on how our study relates to previous studies in primates. Previous recordings in primates show sustained delay period activity that encodes future choice in a substantial fraction of caudate neurons (Schultz et al. 1994, Hikosaka et al. 1989, Schultz & Romo 1988; Kawagoe et al., 1998). However the delay periods in these studies were typically 24s, which is much shorter than the 10s delays used in our task, and there was a low proportion of neurons that showed sustained activity over that delay period (less than 10% of task modulated caudate neurons had sustained activity in one study that quantified this with delay periods up to 4s, i.e. Hikosaka et a. 1989, and less than a third of recorded neurons were found to have sustained memory related activity in another study that used delay periods 11.5s long, i.e. Kawagoe et al. 1988). In our study we do observe some neurons with sample encoding during the delay period that persisted for 24s (such as the one illustrated in Author response image 1), in agreement with prior work. Given that the prior studies did not employ longer delay periods, we do not think our new data contradicts the prior studies. Thank you very much for the positive comments about our manuscript and the analysis. Below, we have performed new analyses to address your concerns, based on using the head tracking data collected during the recordings. Thank you for these helpful comments and suggestions. As you mention, our claim is that we see encoding of the sample stimulus towards the onset of the delay period and that this sample encoding is not simply a byproduct of encoding of body position, location, or motor actions. We support this claim by the following approaches: first by more carefully examining the onset of the delay period when the rat presses the sample lever, and second by examining the time during the delay period during which the rats’ position for the right and left sample trials converge. Before describing the details of these analyses, we want to point out that although we are controlling for the rats’ head position and action in both of these analyses, we recognize that what we refer to as sample encoding may in fact be encoding of an action intended to be executed in the future, sometimes referred to as premotor activity or prospective memory. In fact, given that there is a one-to-one mapping between the identity of the sample lever and the correct choice lever to be pressed at the offset of the delay period, our task design does not allow us to easily distinguish between retrospective and prospective memory (i.e. sample encoding versus premotor activity). We now bring up this important caveat up in the Discussion- thank you for bringing it up. It is worth noting that in the second analysis described below for which we examine the time during the delay period during which the head position trajectories converge, the head position is similar for left and right trials for several seconds following the time window being analyzed, as will be evident in the occupancy maps. In the first analysis, we show that the firing patterns at the onset of the delay period cannot be fully accounted for by position or action, by showing dramatic differences in encoding of lever identity for sample presses versus choice presses. This is a meaningful comparison because the rats are doing similar actions (i.e. pressing the left or right lever), but in a different context within the trial (i.e. sample vs choice press). We have now replotted the sample versus choice analysis in Figure 7 (previously Figure 5) using a shorter time window (only ± 0.25s around the lever press, rather than ± 1s as before). The new time window was chosen to minimize movement before and after the lever press (see similarity in head position for sample and choice lever presses during this time window in 7A). This ensures that we do not include any additional motor actions such as anticipatory licking at the reward port, or movement towards or away from the lever for this analysis. In Figure 7A, we report the similarity in head position of the choice lever presses and sample lever presses. Next, in Figure 7B, we show an example neuron that responds to right sample presses but not to right choice presses. This observation cannot be explained merely as a result of encoding of motor actions, location, or body position since the rat performs the same action at a similar location but we observed very different neural responses. Much like the example neuron (Figure 7B), across the population of recorded neurons (Figure 7C), some neurons preferentially encoded lever identity during the sample press, while others during the choice press. In fact, there was significantly more dispersion in the difference between sample and choice information than expected by chance (inset in Figure 7C, p < 105; two sample Ftest for equality of variance for (sample information choice information) in real vs. shuffled data). This analysis supports the conclusion that DMS firing patterns are not merely reflecting position or motor actions. In our second analysis, we instead examine a time point during the delay period during which the movement trajectories converge for left and right sample trials. Following the sample press, rats move to the opposite wall and wait in front of the nose port for the delay period to end (Figure 1—figure supplement 1A). For this analysis, instead of aligning trials to the beginning of the delay period (i.e. the sample lever press, Figure 6), we align trials to the moment the rats first arrive at the nose port, excluding the small subset of trials in which they left the nose port within 1.5 seconds of the nose port arrival. Note that the head position is very similar for left and right sample trials at the nose port arrival time and in the following seconds (Figure 6—figure supplement 1A). We then assess the ability of our population decoder to decode the sample stimulus from the neural data using leaveoneout cross validation with a 0.5s wide sliding window (same approach used in Figure 6). We noted high decoding accuracy, even during the first 1.5s during which the rat always maintains its head position in front of the nose port (see Figure 6—figure supplement 1B). This is important as it provides evidence of memory encoding within striatal neurons during the delay period while carefully controlling for the rats’ position on left vs right sample trials. Note that the decoding accuracy is highest preceding the nosepoke arrival, which is consistent with our conclusion that sample encoding is highest at the onset of the delay period. These are helpful suggestions to address the possibility of sample selectivity and sequential activity being a byproduct of position/motor variables such as head position, head direction, and velocity. In fact, we feel it is reasonable to expect neurons to display a mixture of selectivity for position/motor variables and for memories of taskrelated variables. However, one of our conclusions is that neural activity cannot be fully explained without taskrelated variables, such as the memory of sample stimulus or time from delay onset. To determine if this conclusion is justified, we sought to determine quantitatively if taskrelated variables had predictive power, even when accounting for motor variables. Towards this end, we modeled neural activity based on both task related variables and motor related variables. More specifically, we modeled each neuron's spiking activity using two generalized linear models (GLMs): one with only position related predictors and the other with both taskrelated and positionrelated predictors. The position/motion predictors we used were head position, head direction, and head velocity and the taskrelated variables were time from delay period onset, sample stimulus of current trial, and the interaction between time and sample stimulus. We performed a nested model likelihood ratio test for each neuron to compare the two models, to determine if the addition of the taskrelated variables improved the model (note that a likelihood ratio test controls appropriately for the difference in number of parameters between the models and that these models were based on delayperiod data only). For more than 90% of neurons, the model significantly improved when including the taskrelated variables (p < 0.0001, likelihood ratio test comparing models with and without task related variables as predictor). This provides quantitative evidence that there is significant taskrelated encoding in these neurons, even when quantitatively accounting for the motor variables. Again, thank you for the suggestions to better account for head position and movements in our analyses – we are confident that our paper is much stronger as a result. Thank you for this comment. In fact, we do one comparison for each neuron – not one comparison for each timepoint. The threshold is defined as the expected peak value across the entire time period, regardless of when the peak information occurs. With the current method, we expect the number of false positive neurons to be 1%. We appreciate that you pointed this out as a potential source of ambiguity and so we now provide a clearer explanation in the Methods. Thank you for your positive comments. We are delighted that you found our study intriguing and that you share our enthusiasm about these findings. Thank you for these points. We now cite some classic papers and also some more recent studies that report stronger activity and more information at the onset of the delay period in LIP and FEF (Clark, Noudoost, and Moore 2012; Bruce et al. 1985; Colby, Duhamel, and Goldberg 1996; Gregoriou, Gotts, and Desimone 2012). Thank you for the additional reference we now cite (Cromer et al. 2011). In addition, we agree that is a good point that there may be important species differences in neural correlates of working memory between rodents and primates. We now mention this in the Discussion. This is a very good point thank you for bringing this up. We now reference the models of (Mongillo, Barak, and Tsodyks 2008; Stokes 2015; Lundqvist et al. 2010) in our Discussion as a possible interpretation of our results. We would like to thank J Pillow for helpful suggestions with the data analysis; C Brody and M Murthy for comments on this manuscript; and the rest of the Witten lab for feedback and help with this work. This work was supported by the Pew, McKnight, NARSAD and Sloan Foundations, NIH DP2 DA035149, NIH R01 MH106689, and an NSF GRFP. Animal experimentation: This study was performed in strict accordance with the recommendations in the Guide for the Care and Use of Laboratory Animals of the National Institutes of Health. All of the animals were handled according to approved institutional animal care and use committee (IACUC) protocols (1876-15) of Princeton University. All surgery was performed under anesthesia, and every effort was made to minimize suffering. © 2016, Akhlaghpour et al.